My faith in God allowed me to shed that fear and have faith that He would take care of me and everything would turn out the way it was meant to in the end. It would have been easy for Nautica Copper to give up on herself and her dreams after finding herself homeless in a new city. Instead, she used her new relationship with Christ to give her the strength to overcome temptation and finally believe in herself and her future. Through hard work and His guiding hand, Cooper has found her way off of the streets and into a happy healthy life. As a teenager, Cooper was a party girl. After growing bored of life in the suburbs she moved in with a family member in New York. This is where she would face her toughest trials, and she documented it all in her diary. 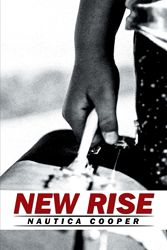 New Rise is based on Cooper’s journey to Christ. Cooper fought to change herself while she was blinded by love, tempted by drugs and alcohol, and had no roof over her head. But, her toughest trial would be attempting to learn the way of the Lord from a man who struggled to choose a relationship with Him over his gang. Cooper is now in South Carolina, where she works to help the homeless and spread encouragement to those who find themselves on a difficult path. For more information, visit nauticacooper.com. Nautica Cooper is a driven, hardworking young lady in the pursuit to motivate and help others. She has been documenting her whole life in her diary, which eventually led to her decision to share her story. She is a proud mother to her daughter Leah, who gave her strength to keep moving forward through the hard times. She is a strong believer in Christ, who deserves the highest credit for her story.